I’ve only had this palette for a few months, however as soon as I got it I could not stop using it. 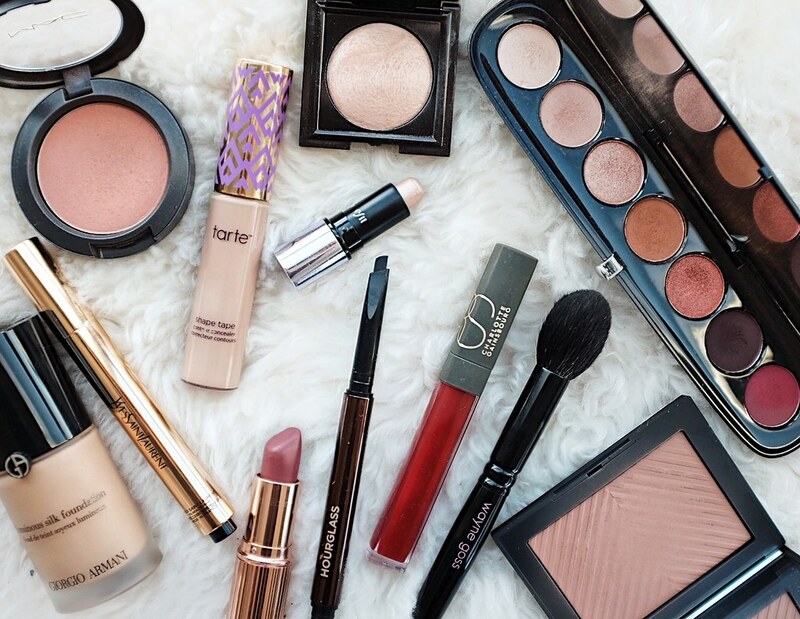 The shades are perfect for the week days when I have to tone down my makeup at work, and there are also some shades I can use to make a very dramatic look. The quality of these shadows are just spectacular, and they’re also very easy to work with. But what makes it so different from all the other warm-toned palettes I have in my collection? Simply put, this palette doesn’t make things complicated for me. It has 7 shades; I know which ones I can use for a neutral look, and I know what I can use if I want something a little more edgy. Its ease of use, pleasant aesthetic, and portability is what made it one of my favourites of this year. 2017 has been the year of the brow for me. I have been doing them fairly thick for the past little while, and I also played around with the shape of them. I struggled so much to get them to look the way I wanted them to (i.e. natural and thick), and as we all know, doing so is a tedious task. Cue the Hourglass brow pencil. It has been a life-saver on the days when I don’t have the time or the patience to perfect my brows, which I would say is the majority of the time. This pencil helps me to get a fuller, more natural look in under 5 minutes. The slim and long shape of the pencil really helps with cutting down the time to draw brows on. It is quite expensive however it comes with a decent amount of product, and anything that can buy time is well worth the money to me! I’ve always wanted to try this concealer out ever since I found out about it a few years ago. One major thing that held me back was its hefty price tag, however I decided to finally try it to see whether it was really all that and a bag of potato chips. Unfortunately for my wallet, I loved it. Although it doesn’t have the most pigmentation, it gives me just the right amount of coverage and brightness I need for an every day look. It also looks very natural and skin-like. Whenever I wear it, people never think I’m wearing makeup, and that’s the kind of look I strive for on a day-to-day basis. I recently reviewed this product so I won’t go into too much detail, but this seriously is such a good concealer! It is creamy, extremely pigmented, blendable, and looks good whether you want a more natural look or prefer a flawless, airbrushed look. The hype machine really did good with this one y’all. 10/10 would buy again. You know that fresh flush your face gets when you’ve had just the right amount of sun on a hot summer day? This blush is the essence of that, but in a powder form. If I could have that sunkissed flush look all days of the year, I would, hence why I can’t stop using this blush! I love how natural it looks on the skin and how much it livens up the face. Definitely an unsung hero! I wrote a review on these brushes about a year ago, and I’m still a huge fan of them. I also bought the Air Brush from the line shortly after and it has also become a part of my daily rotation of brushes. They are a bit expensive, but they are some of the best brushes I own in terms of quality and price. I’ve been using them nonstop and they all still look and feel as perfect and soft as they were when I received them. If you are looking for some great quality natural bristle brushes, I highly recommend the ones by Wayne Goss. This was part of my (mostly failed) Project Pan 2017, and although I didn’t finish it by the end of the year, I still managed to use up a decent amount and I still really do enjoy using it. I’m not sure why this product isn’t talked about more, it is perfect for giving your skin a luminous sheen without the sparkles and glitter. It is so easy to work with and clearly, it lasts forever! I received this as a sample with a Sephora order earlier this month, and I absolutely love it. Don’t let the name of this product fool you, it is absolutely not matte in the slightest. I think the best way to describe this product is the powder version of the Benefit Watt’s Up Highlighter. It doesn’t have a foiled look, it has absolutely no glitter or sparkles in it, and it just gives your skin a luminous glow, all without looking powdery in the slightest. It’s more of a subtle highlight but it makes the skin look so beautiful. I love using this or the Benefit Watt’s Up on work days to brighten up my face and my mood! This is another product that I’ve reviewed previously. I’m not surprised that this made my favourites list this year. This has been a foundation I’ve loved ever since I first tried it, and it’s always one that I compare other foundations to. It’s a no-frills product; I know that every time I use it, my skin will look beautiful, healthy, natural and flawless. I just wish it wasn’t so darn expensive! I just can’t give this bronzer a break, even though I’ve accumulated quite a few that I’ve liked over the past year. It isn’t the most pigmented bronzer I have, however I love it because of that. I can get fairly heavy-handed with my cheek products, and this bronzer is just so forgiving and looks natural and perfectly blended every time I use it. It’s one that I can rely on for giving my face just the right amount of colour and definition. The Matte Revolution line has definitely become one of my favourite lipstick formulations this past year. Specifically, the shade Bond Girl has become my go-to for my every day makeup looks, and for the times when I have absolutely no idea what to put on my lips. Bond Girl has the ability to transform my face into something fresh and natural yet sultry no matter what. In addition, the formula of these lipsticks are just fantastic. They are so comfortable on the lips, they aren’t drying and they wear very well throughout the day. My makeup wish for 2018 is for NARS to bring back the Lip Tint formula and make it part of their permanent collection. This formula is my absolute holy grail for daily wear. The tint actually shows up and stays put, and the texture is so moisturizing and lightweight that it feels like you’re just wearing a lip balm. It’s not really a gloss, but it’s not a regular lip balm. It’s exactly what it says it is, a lip tint, and the most perfect one at that! I really enjoyed the shade Double Decker as it gave my lips the perfect hint of red. I really regret not purchasing the other two shades from the collection, and I’m praying to the makeup gods that this isn’t the end for this formula. That brings us to the end of my final post for 2017! I’m so happy to have found so many great new products this year, and I’m also glad that some old favourites were able to stay at the top of my list for another year. I hope you guys enjoyed reading this! Please feel free to comment below on your favourite products from 2017. Thank you for those readers who have supported me this past year. I wish you all a happy and safe holiday and new year – I hope to have you back again in 2018! Luminous Silk is on my must try list, along with the Shape Tape. Love your picks! Amazing favourites! I’ve been obsessed with the Marc Jacobs Scandalust eyeshadow, along with the Laura Mercier highlight! I absolutely love the Shape Tape concealer too, as soon as I tried it I finally could understand why everyone was going nuts!! Did you see that Tarte announced they are launching a new product in the Shape Tape range?! I think it’s going to be a foundation… But we’ll see! I just went to check the announcement out! Very interesting, maybe it will be similar to the Clinique 2 in 1 Foundation… looking forward to hearing more news about it!